Can you generate a dispersion relation from the exact solution ? Same here, and snowing again. At 16:30 the dispersion relation is focused on building on the last several minutes. It should be able to be adapted to a cone using the same methodology. Probably need to break out a straight edge and graph paper. I think that the relation between the wavenumber k and the angular frequency omega is perfectly linear for a truncated cone homogeneously filled with a medium having constant, isotropic, electric permittivity and constant magnetic permeability. It follows from the homogeneous electromagnetic wave equation, which for the truncated cone is solved in spherical coordinates via spherical waves (this involves an assumption of spherical ends, instead of flat ends). Is your question what is the effective dispersion relation for a truncated cavity containing a dielectric (with constant properties) filling only a portion of the truncated cone? Or is your question what is the dispersion relation for a truncated cavity containing a dielectric with nonlinear properties? 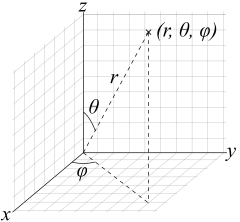 Or anisotropic properties? I was just thinking of the simplest case but based on your exact solution, rather than using that of the cylindrical cavity evaluated at both ends, which is what I have been using. The radii of both ends would presumably be already present in the single (presumably quadratic ?) expression. 1) The resonant cylindrical cavity is solved in terms of its natural coordinates: a cylindrical coordinate system rho(radius), phi(angle) and z (longitudinal coordinate). 2) The resonant truncated cone cavity is solved in terms of its natural coordinates: a spherical coordinate system r(radius), theta (polar angle), and phi(azimuthal angle). Please note that the radial coordinate "r" is entirely different in the spherical coordinate system than the radius "rho" in the cylindrical system. In the spherical system the radius "r" defines the length of the walls of the truncated cone. 2b) There are two eigenvalue problems to solve in the truncated cone: one eigenvalue problem deals with the spherical angle theta (polar angle) and another eigenvalue problem deals with the spherical radius "r". Neither of these two eigenvalue problems has a closed-form solution. Hence the frequency for the truncated cone cannot be expressed as a closed-form solution (using classical functions). The two eigenvalue problems need to be solved numerically. . There is an exact solution, but it is not closed-form. where thetaw is the cone-half-angle and r1 is the radial distance from the origin of the spherical coordinate system to the small base and r2 is the radial distance from the origin of the spherical coordinate system to the big base. 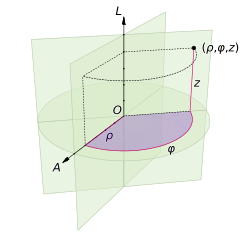 The cone-half-angle appears in the eigenvalue problem for the polar angle theta and the radial distances r1 and r2 appear in the eigenvalue problem for the spherical radius r. Therefore the big and small diameter do not appear explicitly in the truncated cone solution. Instead the truncated cone solution parameters are the cone-half-angle thetaw and the spherical radii r1 and r2. And there is no closed-form solution: the frequency is the result of the numerical solution of two eigenvalue problems (which can be solved with numerical root finding procedures). 3d) The first eigenvalue problem contains Legendre functions (http://en.wikipedia.org/wiki/Legendre_function) of the Cosine of the cone-half angle. 3e) The second eigenvalue problem contains Spherical Bessel functions (http://mathworld.wolfram.com/SphericalBesselFunctionoftheFirstKind.html) in terms of the wavenumber K and the spherical radius. 3f) No cut-off auxiliary equation is necessary for the solution of the truncated cone problem. Purely evanescent modes get cut-off automatically when solving the eigenvalue problem if one is seeking real solutions. There are also interesting degenerate modes in the truncated cone which are resonant within a portion of the cavity and evanescent on another portion of the cavity. One could construct a table of eigenvalues (as done for the cylindrical cavity for Xm,n and X'm,n) in terms of discrete values of the spherical polar angle theta at the walls of the cone (Boundary Conditions thetaw the half-angle of the cone), and some papers for conical waveguides (as in radar) have done this. This is of limited usefulness because it is only useful if one's truncated cone half-angle is in the table (otherwise one has to interpolate), and that solves only the first eigenvalue problem, but for a resonant cavity you still need to solve the second eigenvalue problem for spherical Bessel functions to get the frequency. It would be unwieldy to build a table of eigenvalues for the second eigenvalue problem of the truncated cone in terms of the wavenumber k and the spherical radius r with boundary conditions at r1 and r2. And notice that the table of eigenvalues would not be in terms of diameters or radii of the bases of the truncated cone. Might need to rethink this approach if the goal is to find the optimum thrust cavity configuration rather than an analytic solution for this particular cavity. Sorry I wasn't more explicit with my commentary this morning, but I plead not enough coffee! But to answer your first and second questions, the circular waveguide picture was supplied just as a marker from where we started from, that led us to the conclusion that we would have to model the E&M resonances in the copper frustum in the best manner possible before going forward with our testing. I was NOT trying to imply that COMSOL was used to generate this circular waveguide modes table and the source given was where I found it. That said the NASA/JSC/EP group where we work had one COMSOL license seat that had to be shared amongst all the engineers who had a need for its analytical capabilities. We were also lucky enough to have one EP5 electrical engineer, Frank Davies, from Rice University who had taken an interest into what Sonny and I were doing in the Eagleworks Lab because his office mate also had a deep interest in the topic. And as it turned out Frank also knew how to work COMSOL for his battery research work that he does for his day job at NASA/JSC. Where this interest led is demonstrated in Frank's COMSOL summary report I posted this morning. And yes this COMSOL analysis was for the copper frustum without any dielectric discs in in it. For question 3, I agree with you on all counts, but you have to remember that we were a bunch of electrical and aerospace engineers that only vaguely remembered their E&M from 20 to 40 years ago so we had to learn or relearn a lot of E&M basics before getting around to nit picking the details you are worried about. Well this is a gut check moment and there is no doubt this post will be controversial and might get me in trouble for being off topic and for the subject matter. I am being serious here. I'm no dummy. Either we didn't figure out jack or we actually did. It seems very likely that we did. If we did, we weren't the first. We all know how the world works. If a bunch of guys on an internet forum can figure out the basic principles of "q-thrusters".... someone else has already perfected them and kept them black; rightfully so. The cat is now out of the bag gentlemen. We want to explore space. I want to see human space missions to the planets. We all do. Please give what you have to the world. Sorry moderators. This won't happen again. I don't want the thread to devolve into this kind of discussion. I am pointing out the obvious. I'll delete the post if asked to do so. Strong H field at dielectric disc. Just like theory suggests. Wow. Those are quite remarkable papers. It seems like a very likely cause for the thrust, with previous published results availing it. I wonder why the research wasn't pursued to its logical conclusion (a thruster). Maybe the researchers didn't believe they could get usable forces? Symetry violations are hot topics in physic since decades. Maybe EMDrive is some weird version of Wu's device, but as I wrote nearly one year ago, there are many possible explanations and one man life is not enough to try all of them. It's much more efficient to carefully select and focus on problems that would help us create new knowledge and to build controlled experimentations based on what we already know. That the way science is done since centuries. One step at a time. All I'll say is if it wasn't meant to be discussed publicly it wouldn't be, the fact that is, is your answer and that's the end of that OT post by me. Sorry for going off track. What I would really like to do is stack these 2 puppies on the left into a single vertical chamber and try the Cavandish type experiment under battery power w/ a solid-state oscillator. ?? can't get pics to post directly .. must be the Alzhiemers ! (Chris Edit: Hmmm, needs to be attached from your hard drive, as I tried correcting the link, but it doesn't like showing embedded via dropbox it seems). I'm (slowly) collecting parts for an X-band miniature version in the cans shown in the middle of the picture. Anybody have a short taper section from X to something smaller ? Yes, oscillator called for, mode = unknown, F down by 1000, but more sensitive ?? Only .jpg, .png, .gif etc. file formats can show. For example .bmp file extension does not post. Or you can attach the image where it says "Attach" with a button saying "Choose File"
Firstly, I want to thank people on here for really focusing this thread, especially after the first thread had some problems. I can tell you it has the attention of some big hitters at NASA - who I've invited to post in this thread (at least one is already, but I'm not allowed to name him). It has also been suggested we look at summarizing the progress made in this thread into a news article. Obviously, this is out of my comfort zone of things like current launch vehicles, but I'm going to sit down this weekend and read every single post in this thread. Regardless, as I've always said, there's so many members here who would be able to write better articles than I, because they are well versed in the specific subject - which is half the battle. That is even more the case with this thread. So, per the suggestion, I'm looking to crowd source members posting in this thread to look at being part of creating an article to cover this subject. I already have one offer to be part of that team and if you're interested in helping out, then please PM me and we'll set up a joint PM between all interested people as we go.....because probably setting up a thread (private or otherwise) to build it. This is a 81,000 viewed thread, but that's over time and the news site article is where you can get that in a day. The benefit to all is it would get it into a much wider audience and likely bring in a lot more folk who may be able to help with the thread, by nature of the news site being interlinked with the forum.